Do Newspapers Really Need Outrageous Headlines to Sell? You don’t have to be a football fan to know about Michael Vick. We learned, with horror, about the dog fights, and we debated about paying debts to society and second chances when he was given an NFL comeback. 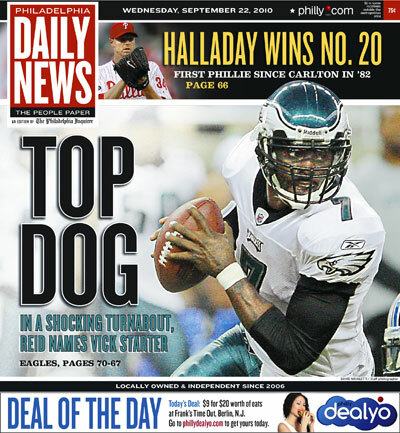 Interesting – now he’s been named starting quarterback for the Philadelphia Eagles, the Philadelphia Daily News is using the headline “Top Dog.” This is the same newspaper that included the headline, “Hide Your Dogs,” when Vick was originally signed. Yardblocker, a football blog, recently posted images of both headlines, leading to a discussion of the NFL and its marketing of star players. However, it would seem the better discussion would address whether or not the Philadelphia Daily News is a daily newspaper or a supermarket tabloid selling to consumers based on outrageous headlines? Entry filed under: Media Industry. Tags: headlines, Michael Vick, newspaper, Philadelphia Daily News, tabloid.